Pope Leo I (c. 400 – 10 November 461), also known as Saint Leo the Great, was Pope from 29 September 440 and died in 461. Pope Benedict XVI said that Leo's papacy "...was undoubtedly one of the most important in the Church's history." According to the Liber Pontificalis, he was a native of Tuscany. By 431, as a deacon, he was sufficiently well known outside of Rome that John Cassian dedicated to him the treatise against Nestorius written at Leo's suggestion. About this time Cyril of Alexandria appealed to Rome regarding a jurisdictional dispute with Juvenal of Jerusalem, but it is not entirely clear whether the letter was intended for Leo, in his capacity of archdeacon, or for Pope Celestine I directly. Near the end of the reign of Pope Sixtus III, Leo was dispatched at the request of Emperor Valentinian III to settle a dispute between Aëtius, one of Gaul's chief military commanders, and the chief magistrate Caecina Decius Aginatius Albinus. Johann Peter Kirsch sees this commission as a proof of the confidence placed in the able deacon by the Imperial Court. During his absence in Gaul, Pope Sixtus III died (11 August 440), and on 29 September Leo was unanimously elected by the people to succeed him. Soon after assuming the papal throne Leo learned that in Aquileia, Pelagians were received into church communion without formal repudiation of their errors; he censured this practice and directed that a provincial synod be held where such former Pelagians be required make an unequivocal abjuration. Manichaeans fleeing the Vandals had come to Rome in 439 and secretly organized there; Leo learned of it around 443, and proceeded against them by holding a public debate with their representatives, burning their books and writing letters of warning to the Italian bishops. His attitude was as decided against the Priscillianists. Bishop Turibius of Astorga, astonished at the spread of the sect in Spain, had addressed the other Spanish bishops on the subject, sending a copy of his letter to Leo, who took the opportunity to write an extended treatise (21 July 447) against the sect, examining its false teaching in detail and calling for a Spanish general council to investigate whether it had any adherents in the episcopate. From a pastoral perspective he galvanized charitable works in a Rome beset by famines, an influx of refugees, and poverty. He further associated the practice of fasting with charity and almsgiving particularly on the occasion of the Quattro tempora, (the quarterly Ember days). Leo drew many learned men about him and chose Prosper of Aquitaine to act in some secretarial or notarial capacity. Leo was a significant contributor to the centralisation of spiritual authority within the Church and in reaffirming papal authority. The bishop of Rome had gradually become viewed as the chief patriarch in the Western church. On several occasions Leo was asked to arbitrate disputes in Gaul. Patroclus of Arles (d. 426) had received from Pope Zosimus the recognition of a subordinate primacy over the Gallican Church which was strongly asserted by his successor Hilary of Arles. An appeal from Chelidonius of Besançon gave Leo the opportunity to assert the pope's authority over Hilary, who defended himself stoutly at Rome, refusing to recognize Leo's judicial status. Feeling that the primatial rights of the bishop of Rome were threatened, Leo appealed to the civil power for support and obtained, from Valentinian III, a decree of 6 June 445, which recognized the primacy of the bishop of Rome based on the merits of Peter, the dignity of the city, and the legislation of the First Council of Nicaea; and provided for the forcible extradition by provincial governors of any bishop who refused to answer a summons to Rome. Faced with this decree, Hilary submitted to the pope, although under his successor, Ravennius, Leo divided the metropolitan rights between Arles and Vienne (450). In 445, Leo disputed with Patriarch Dioscorus, St Cyril's successor as Patriarch of Alexandria, insisting that the ecclesiastical practice of his see should follow that of Rome on the basis that Mark the Evangelist, the disciple of St Peter and the founder of the Alexandrian Church, could have had no other tradition than that of the prince of the apostles. The fact that the African province of Mauretania Caesariensis had been preserved to the empire and thus to the Nicene faith during the Vandal invasion and, in its isolation, was disposed to rest on outside support, gave Leo an opportunity to assert his authority there. In 446 he wrote to the Church in Mauretania in regard to a number of questions of discipline, stressing the point that laymen were not to be appointed to the episcopate. In a letter to the bishops of Campania, Picenum, and Tuscany (443) he required the observance of all his precepts and those of his predecessors; and he sharply rebuked the bishops of Sicily (447) for their deviation from the Roman custom as to the time of baptism, requiring them to send delegates to the Roman synod to learn the proper practice. Because of the earlier line of division between the western and eastern parts of the Roman Empire, Illyria was ecclesiastically subject to Rome. Pope Innocent I had constituted the metropolitan of Thessalonica his vicar, in order to oppose the growing influence of the patriarch of Constantinople in the area. In a letter of about 446 to a successor bishop of Thessalonica, Anastasius, Leo reproached him for the way he had treated one of the metropolitan bishops subject to him; after giving various instructions about the functions entrusted to Anastasius and stressing that certain powers were reserved to the pope himself, Leo wrote: "The care of the universal Church should converge towards Peter's one seat, and nothing anywhere should be separated from its Head." Almost 100 sermons and 150 letters of Leo I have been preserved. 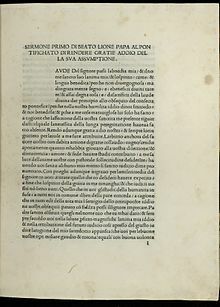 At the Second Council of Ephesus in 449, Leo's representatives delivered his famous Tome, a statement of the faith of the Roman Church in the form of a letter addressed to Archbishop Flavian of Constantinople, which repeats, in close adherence to Augustine of Hippo, the formulas of western Christology. The council did not read the letter nor did it pay any attention to the protests of Leo's legates but deposed Flavian and Eusebius of Dorylaeum, who appealed to Rome. That is one reason that the council was never recognized as ecumenical and was later repudiated by the Council of Chalcedon. Eutyches, in the beginning of the conflict appealed to Leo and took refuge with him on his condemnation by Flavian, but on receiving full information from Flavian, Leo took his side decisively. Leo demanded of the emperor that an ecumenical council should be held in Italy, and in the meantime, at a Roman synod in October 449, repudiated all the decisions of the "Robber Synod". In his letters to the emperor and others he demanded the deposition of Eutyches as a Manichaean and Docetic heretic. The Council of Chalcedon of 451 rejected the heresy of Eutyches who denied the true human nature of the Son of God, and affirmed the union in his one Person, without confusion and without separation, of his two natures, human and divine. The acts of the council report: "After the reading of the foregoing epistle, the most reverend bishops cried out: This is the faith of the fathers, this is the faith of the Apostles. So we all believe, thus the orthodox believe. Anathema to him who does not thus believe. Peter has spoken thus through Leo. So taught the Apostles. Piously and truly did Leo teach, so taught Cyril. Everlasting be the memory of Cyril. Leo and Cyril taught the same thing, anathema to him who does not so believe. This is the true faith. Those of us who are orthodox thus believe. This is the faith of the fathers. Why were not these things read at Ephesus? These are the things Dioscorus hid away." Leo firmly declined to confirm their disciplinary arrangements, which seemed to allow Constantinople a practically equal authority with Rome and regarded the civil importance of a city as a determining factor in its ecclesiastical position; but he strongly supported its dogmatic decrees, especially when, after the accession of Leo I the Thracian (457), there seemed to be a disposition toward compromise with the Eutychians. Leo's writings (both the sermons and the letters) are mostly concerned with theological questions concerning the person of Jesus Christ (Christology) and his role as mediator and savior (Soteriology), which is partially connected to the Council of Chalcedon in which Roman legates participated in Leo's name. Subsequently, through numerous letters addressed to bishops and members of the imperial family, Leo incessantly worked for the propagation and universal reception of the faith in Christ as defined by Chalcedon, also in the eastern part of the Roman empire. Leo defends the true divinity and the true humanity of the one Christ against heretical one-sidedness. He takes up this topic also in many of his sermons, and over the years, he further develops his own original concepts. A central idea around which Leo deepens and explains his theology is Christ's presence in the Church, more specifically in the teaching and preaching of the faith (Scripture, Tradition and their interpretation), in the liturgy (sacraments and celebrations), in the life of the individual believer and of the organized Church, especially in a council. To Leo the Great, Mariology is determined by Christology. If Christ were divine only, everything about him would be divine. Only his divinity would have been crucified, buried and resurrected. Mary would only be the mother of God, and Christians would have no hope for their own resurrection. The nucleus of Christianity would be destroyed. The most unusual beginning of a truly human life through her was to give birth to Jesus, the Lord and Son of King David. Leo assumed the papacy at a time of increasing barbarian invasions; this, coupled with the decreasing imperial authority in the West, forced the Bishop of Rome to take a more active part in civic and political affairs. He was one of the first bishops of Rome to promote papal primacy based on succession from St. Peter; and he did so as a means of maintaining unity among the churches. Besides recourse to biblical language, Leo also described his own special relationship with St Peter in terms derived from Roman law. He called himself the (unworthy) heir and deputy (vicarius) of Peter, having received his apostolic authority and being obliged to follow his example. On the one hand, Peter stood before him with a claim on how Leo is to exercise his office; on the other hand, Leo, as the Roman bishop, represented the Apostle, whose authority he held. Christ, however, always comes out as the source of all grace and authority, and Leo is responsible to him for how he fulfilled his duties (sermon 1). Thus, the office of the Roman bishop, was grounded on the special relationship between Christ and St Peter, a relationship that cannot be repeated per se; therefore, Leo depended on St Peter's mediation, his assistance and his example in order to be able to adequately fulfill his role and exercise his authority as the Bishop of Rome, both in the city and beyond. 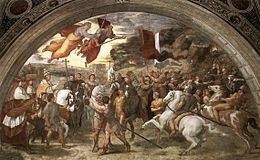 Despite his defeat at the Battle of Chalons in 451, Attila invaded Italy in 452, sacking cities such as Aquileia and heading for Rome. He allegedly demanded that the sister of the reigning Emperor Valentinian III be sent to him with a dowry. In response, the emperor sent three envoys to negotiate with Attila: Gennadius Avienus, one of the consuls of 450, Memmius Aemilius Trygetius, the former urban prefect, and Leo. Little is known of the specifics of the negotiations, as a result of which Attila withdrew. Most ancient and medieval historians celebrated Leo's actions, giving him all the credit for this successful embassy. According to Prosper of Aquitaine who was alive at the time of the event, Attila was so impressed by Leo that he withdrew. Another near-contemporary was the historian Priscus who records that Attila was dissuaded from attacking Rome by his own men because they feared he would share the fate of the Visigothic king Alaric, who died shortly after sacking the city in 410. Paul the Deacon, in the late 8th century, relates that an enormously huge man dressed in priestly robes and armed with a sword, visible only to Attila, threatened him and his army with death during his discourse with Leo, and this prompted Attila to submit to his request. The fact of the embassy cannot be doubted. The distinguished ambassadors visited the Hun's camp near the south shore of Lake Garda. It is also certain that Attila suddenly retreated. But we are at a loss to know what considerations were offered him to induce him to depart. It is unreasonable to suppose that this heathen king would have cared for the thunders or persuasions of the Church. The Emperor refused to surrender Honoria, and it is not recorded that money was paid. A trustworthy chronicle hands down another account which does not conflict with the fact that an embassy was sent, but evidently furnishes the true reasons which moved Attila to receive it favourably. Plague broke out in the barbarian host and their food ran short, and at the same time troops arrived from the east, sent by Marcian to the aid of Italy. If his host was suffering from pestilence, and if troops arrived from the east, we can understand that Attila was forced to withdraw. But whatever terms were arranged, he did not pretend that they meant a permanent peace. The question of Honoria was left unsettled, and he threatened that he would come again and do worse things in Italy unless she were given up with the due portion of the Imperial possessions. Leo's intercession could not prevent the sack of the city by the Vandal King Genseric in 455, but murder and arson were repressed by his influence. The Pope and members of his clergy, went to meet the invader to implore him to desist. While the Vandals plundered the city, the gesture nevertheless prevented Rome from being burned and assured that the Basilicas of St Peter, St Paul and St John, in which part of the terrified population sought refuge, were spared. Leo did, however, assist in rebuilding the city of Rome; restoring key places such as Saint Peter's. Leo died on 10 November 461 and, as he wished to be buried as close as possible to the tomb of St Peter, his body was placed in a tomb in the portico of Saint Peter's basilica. In 688 his remains were moved inside the basilica itself. Pope Benedict XVI said that Leo's papacy "...was undoubtedly one of the most important in the Church's history." According to Leo and several Church Fathers as well as certain interpretations of the Scriptures, the Church is built upon Peter, in pursuance of the promise of Matthew 16:16–19. Peter participates in everything which is Christ's; what the other apostles have in common with him they have through him. What is true of Peter is true also of his successors. Every other bishop is charged with the care of his particular flock, the Roman pontiff with that of the whole Church. Other bishops are his assistants in this great task. In Leo's eyes the decrees of the Council of Chalcedon acquired their validity from his confirmation. Leo's letters and sermons reflect the many aspects of his career and personality and are invaluable historical sources. His rhythmic prose style, called cursus leonicus, influenced ecclesiastical language for centuries. The Catholic Church marks 10 November as the feast day of Saint Leo, given in the Martyrologium Hieronymianum and the 8th-century Calendar of Saint Willibrord as the date of his death and entry to heaven. His feast was once celebrated in Rome on 28 June, the anniversary of the placing of his relics in Saint Peter's Basilica, but in the 12th century, the Gallican Rite feast of 11 April was admitted to the General Roman Calendar, which maintained that date until 1969. Some traditionalist Catholics continue to observe pre-1970 versions of that calendar. ^ a b c Lives of the Saints, John J. Crawley & Co., Inc.
^ J. B. Bury, History of the Later Roman Empire, Macmillan 1923, p. 295-6. Alois Grillmeier: "Christ in Christian Tradition", vols. 1 and 2/1, Westminster ML 1988/1987 (2nd revised edition), ISBN 978-0664223014 (Vol. 1), ISBN 978-0664221607 (Vol. 2, pt. 1). Basil Studer: Art.Leo the Great, in A. DiBerardino: Patrology IV, Westminster ML 1994, S. 589-612. Alois Grillmeier: Jesus der Christus im Glauben der Kirche, Bd. 1 (Freiburg u.a. 1990), S. 734-750; Bd. 2/1 (Freiburg 1991), S. 131-200. Ekkart Sauser (1992). "Pope Leo I". In Bautz, Traugott. Biographisch-Bibliographisches Kirchenlexikon (BBKL) (in German). 4. Herzberg: Bautz. cols. 1425–1435. ISBN 3-88309-038-7. Rudolf Schieffer: Leo I. der Große in: Lexikon des Mittelalters. Vol. 5, Artemis & Winkler, Munich/Zurich 1991, ISBN 3-7608-8905-0, Col. 1876–1877. Wikimedia Commons has media related to Leo the Great.